WASHINGTON -- The Washington Capitals began celebrating their 40th anniversary season Thursday when they faced off against the Montreal Canadiens in their season opener at Verizon Center. It was an occasion to savor, considering the franchise's struggles during its first decade. The Capitals finished last in their division in six of their first eight seasons. Their first-season won-lost mark of 8-67-5 represents the NHL single-season records for fewest wins and points (21) in a season. The on-ice struggles led to low fan turnout and interest. Owner Abe Pollin threatened relocation. But the Capitals ultimately stayed put, with a big assist from a September 1982 trade with the Canadiens that brought defenseman and future Hall of Famer Rod Langway to Washington. "[Craig Laughlin and I] get on the phone to our agents," Langway recalled, "and we said, 'Are we sure we want to be here?'" Added Laughlin, one of six players involved in the trade and now the Capitals' television analyst: "When we arrived, we were on the plane together and we said, 'No. 1, where's Washington?'" Led by Langway, the Capitals qualified for the Stanley Cup Playoffs for the first time in 1982-83 and became a regular postseason participant. "We saw the trade as a tremendous win for the Washington Capitals," said defenseman Sylvain Cote, who spent the majority of his 19 NHL seasons in Washington. "Rod Langway pretty much by himself really put this team here on the map for generations." A new generation of fans was born in the late 1990s, when the Capitals moved from suburban Landover, Md., to downtown Washington. They christened the state-of-the-art arena now known as Verizon Center by appearing in their first and only Stanley Cup Final. The Chinatown neighborhood, once desolate, morphed into a nightlife destination. "It felt like a hockey town," recalled forward Peter Bondra, the franchise's all-time leader in goals and points. "I remember we came back from [the Eastern Conference Final series against the Buffalo Sabres], fans were waiting for us at Piney Orchard, where we practiced. Everybody was excited, us players as well." The arrival of superstar Alex Ovechkin in 2005 precipitated a groundswell of unprecedented support, ushering in the "Rock The Red" era that continues to this day. The League recognized the Capitals' progress in building a loyal fan base by awarding them the 2015 NHL Bridgestone Winter Classic, scheduled to be held at Nationals Park against the Chicago Blackhawks on Jan. 1. "You're going to see how passionate our fans are," Laughlin said. "I just think that it's the evolution of this franchise that they get awarded the Winter Classic. It just wasn't given to them. They had to earn it." When the Capitals opened the season against the Canadiens exactly 40 years after the franchise's first game, they took the ice wearing their jerseys from the 2011 Winter Classic, which were fashioned after the uniforms worn by the 1974-75 team. 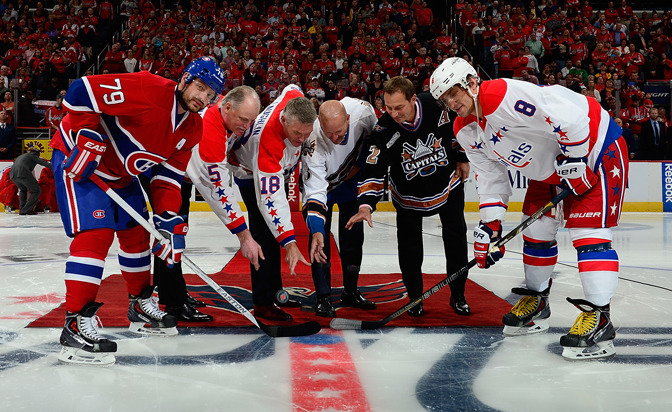 Langway, Laughlin, Cote and Bondra participated in a ceremonial puck drop, with Ovechkin in the faceoff circle to receive it. It was a fitting start to a season-long celebration, though only one thing will provide an appropriate end. "We're getting closer," Bondra said of the Capitals' pursuit of the Stanley Cup. "This might be the year."